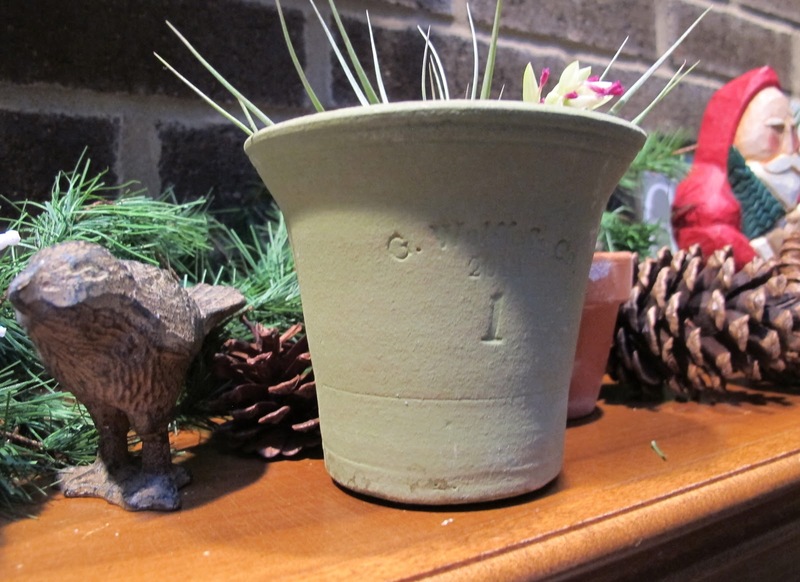 Gardeners, What did you get for Chrismas? I am surely the envy of all gardeners at Christmas-time with my brand new tree garden-y ornament. It is a glass garden fork with a little toad sitting on the handle. I've already hung it on the tree, as you can see, where it adds to my growing collection of gardening-theme ornaments. And yes, I do have a hoe ornament. Doesn't every gardener? 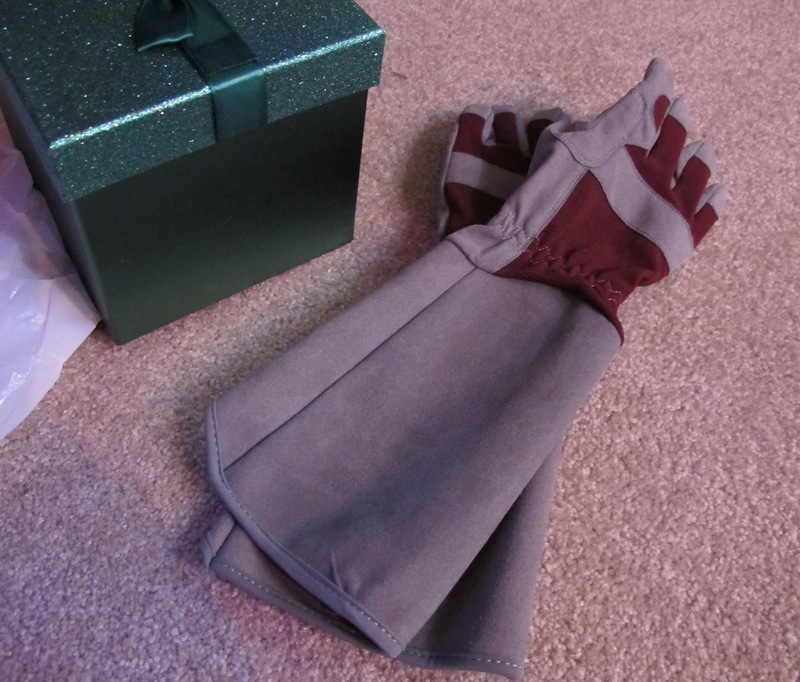 In other good news, I also received a pair of garden gloves to use when I prune roses. I can't imagine any rose thorn penetrating through the heavy suede of these gardening gloves. I am ready for battle. I am ready for spring rose pruning now. Unfortunately, it is not spring, it is winter and there is a blizzard outside, so I'll just have to spend hours admire my gloves, trying them on, over and over, until spring. Just in case every gardener is not already drooling over my ornament and my rose pruning gloves, I'll show you my new Guy Wolff pot. One final word on gardening related gifts. 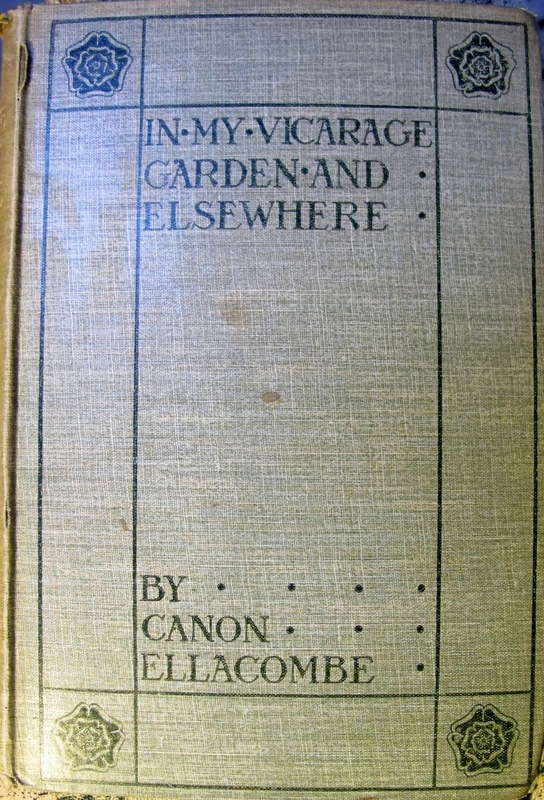 If you got an old gardening book, "mind the fairies" when you open the book. 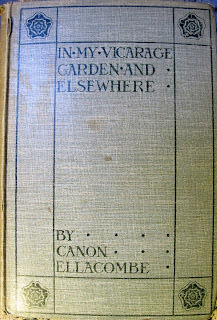 Book fairies are old gardening fairies who were trapped decades ago in old gardening books when these books were last read. When you slowly open the book, the light will wake them up, and then they'll leave and head out to the garden. Knowing this, perhaps it is best if you only open old gardening books in your own home, so the book fairies will at least escape to your own garden. I love your gifts. I got some horse manure for the cold/hot frame! Also various sundry items. Peace & Happiness reign here. It's cold and blustery here today, but the blizzard went south of us, apparently. I hope you had a very Merry Christmas, Carol, and stay warm! You must have been a very good girl this year. The best garden gift I got this year is a one hour theraputic massage, for when I overdo it in the garden this coming spring. Because my family are not gardeners, they have a hard time buying me gardening gifts. But I did receive a Lowe's gift card, and that will be put to good use. Now I GAVE gardening gifts, that's something to note. My son has a new home, and was given a rake, shovel, hose, trowel, and pruners. He said I gave him the gift of yardwork! Is that wrong? I was given some gardening books that I've been coveting - Dirr's Encyclopedia of Trees and Shrubs, Thomas Hobbs' The Jewel Box Garden and Bunny Williams On Garden Style - and subscriptions to Gardens Illustrated and Canadian Gardening. Also, a pair of Felco pruners. Decadence! I got a nifty sunflower feeder for the birds shaped like ... a sunflower! Does it count that I gave it to myself? I did buy Dear Son a bale of straw for his chickens and a fancy heated chicken waterer. I am envious of your garden fork ornament, and with a frog, no less.